Poinsettias are a Schaefer specialty! Buy your Poinsettia today! This year our professional growers have nurtured over 35,000 pots of poinsettias – that’s more than 130,000 cuttings and 225,000 blooms! We start with arrival of stock plants in January and culminate in a breathtaking display of vivid color in late November. Poinsettias are temperature and light sensitive. Special care should be given to protect them from freezing temperatures. If the poinsettia is chilled it may begin to drop leaves. Transport the plant in a warm car and take inside immediately. Do not leave in a parked vehicle or outdoors. Unwrap your poinsettia upon arrival to its final destination. Open the paper sleeve from the bottom and gently lift over the top of the plant. Plants wrapped in closed sleeves for 48 hours may begin to droop. Place your poinsettia in a location with bright natural light, exposure to direct sunlight for no more than one or two hours. Avoid exposure to drafts, heat from appliances, TVs and computers; radiators or ventilation ducts, and heavy traffic. Poinsettias are not poisonous, but should be placed away from small children and animals. Ingestion of the plant could cause mild discomfort. If the poinsettia is foil wrapped, pierce the bottom to allow proper drainage. Place your plant on a waterproof container or saucer to catch the overflow when watering. Keep the soil moist. Do not let the soil dry out. Empty any water that drains into the saucer to prevent leaf drop. Daytime temperatures under 75 degrees F, and night temperatures at 65 degrees F, will keep the colors bright and vivid. Feed blooming poinsettias every 2-3 weeks with a water soluble or liquid fertilizer diluted according to directions. Mist leaves frequently during flowering season. The symbol of Christmas outdoors is the Holly with its bright red berries. Indoors it is now the Poinsettia with its large, scarlet flower-heads. This was not always so. In the early 1960s it was a tall growing shrub which was distinctly difficult to keep in leaf or flower in the average home. Things have changed–modern varieties are bushier, more attractive and much less delicate. In addition, modern chemicals are used to keep the plants small. The result is that the Poinsettia of today is compact (1-1.5 ft. high) and the flowers (which are really colored bracts) should last for 2-6 months. When buying a plant, look at the true flowers (yellow and tiny in the center of the flower-head). They should be unopened for maximum flower life. Also the plant should not have been stood outdoors or in an icy shop. Once in your living room, put it in a well-lit spot, away from draughts and keep it reasonably warm. All Poinsettias are varieties of Euphorbia pulcherrima. Red is the favorite color–types include Barbara Ecke Supreme, Mrs. Paul Ecke and Angelica. Pinks such as Dorothe are not very popular, but the whites and pale creams (Regina, Ecke’s White) are widely available. The most unusual Poinsettia is Marble–the bracts are deep cream with a rosy-red heart. Temperature: Average warmth, minimum 55-60 degrees F. during the flowering season. Light: Maximum light during winter–protect from hot summer sun if plant is to be kept for next Christmas. Water: Water thoroughly–wait until compost is moderately dry before watering again. Water immediately if leaves begin to wilt. Water more liberally in summer. Air Humidity: Mist leaves frequently during the flowering season. Care After Flowering: Plant should be discarded, but if you like a challenge it can be kept and will bloom again next Christmas. The lighting will have to be very carefully controlled in autumn–see detailed instructions below. Propagation: Take stem cuttings in early summer. Use a rooting hormone. When the leaves have fallen, cut back the stems to leave stumps 4 in. high. The compost should be kept almost dry and the pot placed in a mild, shady position. In early May, water and repot the plant, removing some of the old compost. Continue watering and shoots will soon appear. Feed regularly and remove some of the new growth to leave 4-5 strong new stems. The prunings can be used as cuttings. From the end of September careful light control is essential. Cover with a black polythene bag from early evening and remove next morning so that the plant is kept in total darkness for 14 hours. Continue daily for 8 weeks, then treat normally. Your Poinsettia will again be in bloom at Christmas time, but it will be taller than the plant you bought. Cause: The usual reason is dry air in a warm room. 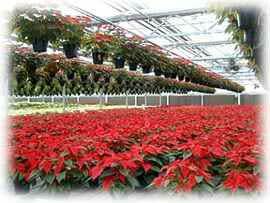 Poinsettia needs moist air, so mist leaves frequently. Red spider mites and mealy bugs are the main pests. See your plant care professional for remedy. Cause: Overwatering is the likely culprit; the surface of the compost must be dry before water is applied. Of course, failure to water when the compost around the roots is dry will also cause leaves to wilt and fall. Cause: If the temperature is too low or if the plant has been subjected to hot or freezing draughts then the leaves will suddenly fall. Another cause of leaf fall is poor light.